Google and China love-hate story is now very familiar to everyone. Google has created a dedicated page where one can see the accessibility and availability of Google services in mainland China. According to this chart, Google Web Search is blocked in China on 29’th July 2010. Other services like YouTube, Sites, Blogger, Picasa are already blocked over there. 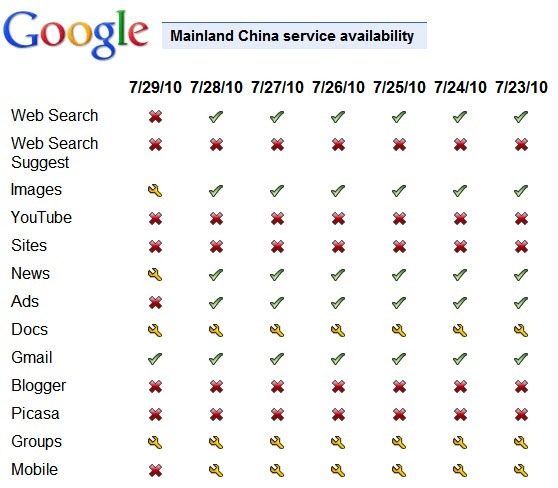 This tracking page of Google updates on daily basis, so you will have an up to date status of Google services in China. If you want to track Google Services availability worldwide or status of those services, then you ca do that thru Apps Dashboard. Update – Google has updated that Google Services like Web Search is not blocked in China and users are able to access services without any problem. There was blockage for small period but the dashboard updated with that only and we can take that s false alarm.